Your kitchen backsplash is like the frosting to your kitchen. Without the backsplash, your kitchen is like a cake without frosting (like a naked cake, but those are actually popular right now). It can get so overwhelming, there are so many options! How can one choose only one? 1) What type of look are you going for? Do you see your kitchen with more color or neutral tones? Yes, color makes a big statement in your kitchen, but will you love that shade of teal forever? Going with a more neutral color allows you to play with color in other ways in your kitchen. 2) Next, think about height. The height is often a detail that is overlooked. Often, cabinetry is a deciding factor for the height, but you may have the option to go up to ceiling height around your sink or cook top area. 3) Here’s the next fun part! Just as important as color is the type of tile you use! There are so many options such as, glass tile, ceramic, brick, and hand painted tile. Glass tile has a shiny gloss to it and will make a big statement in any kitchen. Ceramic tile is made from clay and is permanently hardened by heat. Bricks are rectangular blocks of clay dried by the sun. For a more historical look, research any old buildings that are being demolished and often you can pay to save those bricks. Hand painted tiles are just as they sound, and could run the most expensive depending on which part of the world you purchase them from. The materials you use all depend on the style of your kitchen and the look you are aiming for, but all are beautiful options. 4) Consider your counter tops! This one seems like a no brainer, but some may get so caught up in the specific color they want that they forget their countertops. 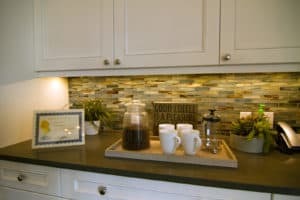 If you have a natural stone with many veins and speckles, chose a backsplash that will complement the stone with more neutral tones. 5) Next, it is time to think about the shape and pattern! If you are going for more of a classic look, stick with horizontal or vertical lines. If you want something a little more unique, try a shape/pattern that is new and daring in a neutral tone so you have the best of both worlds! 6) Lastly, what to consider before pulling the trigger on your dream backsplash, your budget. If you have a budget on the tighter end, consider getting tile that is in stock. Keep in mind that certain glazes and specialty shapes will cost a bit more. The best thing about backsplashes are that there are thousands of them, so you are surely to find one that works best in your kitchen! How to Select the Best Lighting! Award- winning interior designer, Tricia Guy has many years of experience selecting lighting for hundreds of projects, all unique in personal style and lifestyle needs. Tricia knows that there are thousands of lighting options and fun added upgrades, so here are a few tips to make the biggest impact on your space. Selecting the right light color will set the proper feeling to your space. If you love the look and feeling of natural light, than daylight is for you. Daylight provides the incomparable feeling of being outside, enjoying the natural light given off the sun. On the other side of the spectrum, warm white light gives the feeling of cuddling up to a warm fire on a winter night. Warm light embodies yellow tones for a warm and comfortable feeling. If you desire a more modern and contemporary feeling, cool white lighting is the best option for you! Finally, for some extra-added spice, add a pop of color to your kitchen, bar, bathroom or entertainment center. When it comes to adding some fun colors to make a room more interesting, the world is your color wheel! There are many places to add light to enhance any room such as, up lighting and down lighting to give a subtle glow your space. When you sneak out to the kitchen for a midnight snack, toe kick lighting is perfect option to add to your kitchen and even your bathroom. Under cabinet lighting is another essential for your kitchen because it provides the light you need when you’re preparing a meal. Also, under cabinet lighting gives your kitchen a lovely glow at night. Lastly, decorative lighting is one of the best ways to add personality to any room. One suggestion is to designate an outlet in your kitchen for a decorative lamp to show off your personal style (no one wants to see those pesky wires). The best of occasions can lack some luster if your space does not create the right mood. The mood in a room sets the tone for a party full of people or a romantic evening for two. One of the best features you can add to your lights is to make them dimmable. Dimming your lights will able you to create the right mood and setting for any occasion. Painted wood doors for your kitchen cabinets are a popular option. Many people believe they look more professional and are worth the added expense. 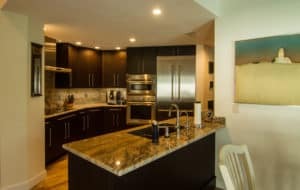 However, a good kitchen designer in Florida will tell you that 5-piece painted MDF doors (made with a 4-piece frame and a center panel) will be much better for your home. Here are three reasons to invest in painted MDF today. The humidity in Florida is unlike many other places in the United States. Painted wood may be fine for your family in the northwest, but in Florida the wood starts to expand and contract with the high humidity. Paint does not expand with added humidity, which leads to cracking of the seams over time. The number one benefit of a 5-piece MDF door is that it does not expand or contract with changes in the weather, meaning there is little risk of the seams cracking. Your kitchen cabinets are likely to be hit with pots and pans or even children on ride-on toys. These little dings can lead to damage with wood fronts. High grade MDF is very dense which means that it can handle more of a beating than a basic wood door, which means your doors will look better for much longer. Technology has advanced considerably over the years, and that is certainly the case when creating 5-piece painted MDF doors. Previously, only one piece or routed MDF painted doors were available. On the front side of the door, these looked pretty close to a wood door, but on the back it was very noticeably not a wood door. With the advancement in glues and resins, it is now possible to make your MDF doors look exactly like 5-piece wood doors. Additionally, all of our cabinet manufacturers making these MDF doors are giving the exact same warranty as their wood doors. Your kitchen cabinets will have the advantages listed above and your friends will never know the difference! In fact, they’ll want to know who your kitchen designer is so they can get their own amazing kitchen. Living in Florida has many perks. A beach is never far away and sunshine 364 days a years (on average). However, there are a few things that come along with our beautiful weather. When it rains, it rains, and we have very high humidity. We are going to review a couple of cabinet solutions that deal with our specific weather in Florida. The kitchen is arguably the most important room in your house. So it makes sense to protect that investment and your cabinets. The first solution is to use adjustable legs on your cabinets. When choosing your cabinet box construction, most people go with plywood. Though it’s more expensive, it isn’t effected by water quite as much as furniture board. No matter what, with wood, water will cause expanding, stability issues, and mold. With choosing the adjustable legs, you can use the more affordable furniture board and just have a plywood sink base. The legs will protect the cabinets up to 4 – 4 1/2 inches of water. The look of the cabinet is the same and if you do encounter a flood under the 4 inch mark, just replace the toe kick and any decorative base boards. That’s a much easier task than replacing all of your cabinets. Another solution we suggest is painted medium density fiberboard (MDF) cabinet fronts. Humidity is definitely an issue in Florida and painted MDF fronts are a great way to combat that. With the popularity of painted finishes these days, they look almost identical to wood doors and have really become a great option. MDF is a high grade, composite material that is more stable than solid wood and is unaffected by changes in heat and humidity. Solid wood boards typically expand and contract both horizontally and vertically which leads to cracking in the seams of the door. Because it’s made from one piece there is no long term cracking or seam separation. Painted MDF is actually a little less expensive than solid wood and usually carries the exact same warranty. When designing your new kitchen it would be wise to consider our solutions, so that you can significantly lower the time spent on the repair and your frustration level. With any home renovation comes stress for financial reason and just the hassle of it. If bad luck does strike you and you end up being one of the unlucky few that falls victim to the fickle Florida weather, wouldn’t it be nice to know you’ve chosen the best option at protecting your home? Enlist the help of a kitchen designer from the very beginning. 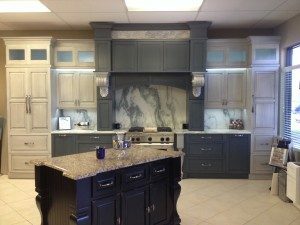 Most cabinetry dealers have skilled designers on staff, so take advantage of this service…they may have excellent recommendations for the layout that your architect or contractor had not considered. It’s best to make these changes before your contractor begins work. It will reduce the number of change orders and delays. Cabinets also take anywhere from 4-8 weeks to receive once the order is placed. This time frame does not include planning. If a designer tells you they can design, price and order your kitchen in 24 hour period, run for your life! Good, error-free designs require careful attention to detail, which requires time. If you want the best kitchen for your budget, don’t rush the planning process. Have a budget in mind and don’t be afraid to tell your designer what it is…again, from the beginning. They need that information in order to properly guide you in making realistic decisions and cutting through all the options available in the cabinetry world. If you’re concerned that the designer will sell you a $5000 kitchen and charge you the $10,000 budget you given them, you shouldn’t be working with that designer…period. Work only with people you like and trust. Get referrals, check references. Being honest about your budget will also save you the disappointment of realizing your budget doesn’t fit the fancy pull-out pantry insert or custom door style you fell in love with. Expect the unexpected, stay calm and give the professionals time to address any issues that come up. Mistakes will happen, unexpected delays will arise. Generally, issues are small and easily resolved (a drawer front received some damage during shipping), but sometimes they’re big (your contractor discovers mold). When you’re looking for professionals to work with, what you want to look for is someone who has a reputation for seeing the job through to completion and who addresses issues promptly and professionally, and it helps to give them the chance to do this. In my experience, it’s worth noting that the clients who don’t get too worked up about unforeseen issues or delays seem to experience the least of them. If you have the option to stay elsewhere while the work is being done, by all means, do this. There will be dust…lots of it! Be sure to protect belongings with sheets…even in areas you think will be unaffected. It will make clean up a lot easier. The expense of eating out for several weeks adds up, so be sure to take that into consideration when thinking about your budget, if that’s your plan. If you’re on a tight budget, however, you have the option of setting up a makeshift kitchen elsewhere in the home. You’ll need a microwave, a toaster (ideally a toaster oven,) a refrigerator and if possible, a sink. If you have a laundry sink, this is the ideal spot. Bathroom sinks, not so much. They’re small, it’s difficult to wash dishes and fill pots in. The environmentalist in me hates to recommend this, but if it will make your life easier, use disposable plates and utensils. Then go plant a tree after all is said and done. Kitchen remodels are never stress-free. However, if you plan carefully and follow these tips, you’ll stress-less. As you’re enjoying a beautiful, functional kitchen for years to come, you’ll be glad you tackled the project!